I have worked in the funeral industry since 1998, starting out as a funeral service operative and progressing to my current role as senior funeral director. 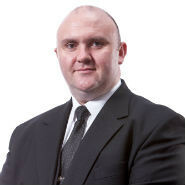 I am currently based at Forrester Park branch but also manage other branches in the Edinburgh area. I am extremely passionate about my job and I am proud to be associated with Scotmid Co-operative, I take great pride in my role and I am well known, valued and respected within the surrounding communities. I live in Edinburgh with my wife and 3 children (2 boys and a girl)…… so life outside work is very busy too.